Gayle Leland Nyhus, was born on January 19, 1934 at home, the son of Alvin and Gladys (Torgrimson) Nyhus. He grew up on the family farm near Vining and graduated eighth grade from the Vining school. He continued is education in Henning, graduating in 1952. 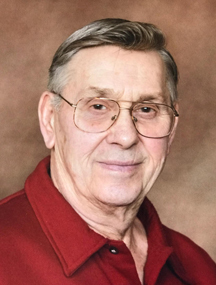 Gayle started farming with his parents and joined the U.S. Army Reserves in 1957. He took his six-month basic training at Fort Leonard Wood, MO. During the Berlin Crisis, the 32nd Infantry Division was called to active duty and Gayle served at Fort Lewis, WA from 1961-1962 with the 121st Artillery. During this time his brother Dennis and family returned to the farm, milking the cows and putting in the crops. Gayle was married to Marlene Haugdahl at the United Lutheran Church in Henning on June 1, 1963. They were blessed with one son, Greg. Marlene passed away in 2002. Gayle was a life-long member of Vining Lutheran Church, being baptized and confirmed there. He retired from farming in 2002 and then had time to pursue his other interests, which were welding, woodworking and gardening. Gayle loved to “putter” and fix things. Gayle passed away on Saturday, March 16, 2019 at the Henning Nursing and Rehabilitation Center, at 85 years of age. He is preceded in death by his wife, Marlene, parents, and brother Dennis. Survivors include his son, Gregory (Amy) Nyhus of Canton, GA; sister-in-law, Carleen Nyhus; brother-in-law, Richard (Norma) Haugdahl; several nieces, nephews, and his special friend, Dolores Peterson.